A look at Sweden’s housing market highlights the huge risks that are building up in the Nordic country. It also serves as a warning for the UK, as house prices in south-east England hit record highs. The Swedish property sector is overheated and could pop, taking the banks down with it. 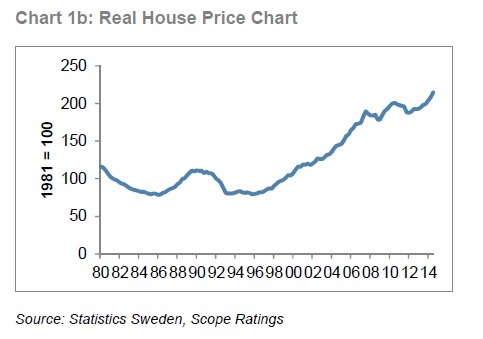 How the Swedish housing bubble got inflated. Source: Scope Ratings. House prices in Sweden jumped by 196% in nominal terms – that is 96% in real terms, after accounting for inflation – since 1990, European credit rating agency Scope Ratings said in a report it issued on the Swedish banks it rates. Indicators of house price fundamentals are “well above their historical norms,” Scope Ratings’ calculations show. The price/rent ratio and the price/disposable income ratio are higher now than they were in the previous cycle, back in 1990. Sweden experienced a boom in house prices between 1985 and 1990, then went through a severe crisis. At the turn of the century, the US Federal Reserve eased monetary policy further, after the dotcom bubble burst. This pushed up asset prices everywhere in the world, as interest rates fell. 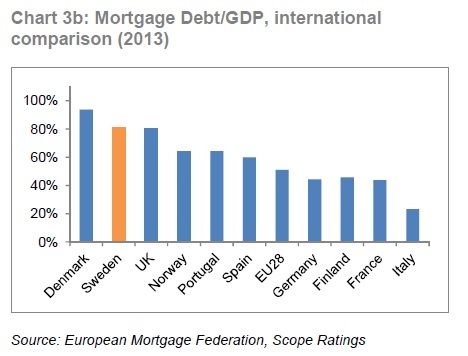 In Sweden, mortgage debt more than trebled between January 2002 and June 2014, with the loans financing properties that became more and more expensive, particularly in the big cities. Crucially, the increase in mortgage debt was much faster than economic growth, Scope Ratings noted. The proportion of mortgage debt to GDP swelled to 81% in the period, from 48%. It is one of the highest in the developed world. Mortgages to GDP, a comparison. Source: Scope Ratings. What factors contributed to inflating the housing bubble so much and so quickly in Sweden? Marco Troiano, the author of the Scope Ratings report, identified several factors that encouraged demand, such as interest rates declining much faster than inflation, expectations of further increases in house prices becoming entrenched and tight regulations on construction and the rental market. Sweden also gradually introduced a string of tax incentives for house purchases: a 30% deduction on mortgage interest, which helps people take larger mortgages, the replacement of the property tax with a capped fee, the abolishing of inheritance and wealth taxes, the flat 22% capital gains tax that is applied only at realisation of the gains and the fact that the share of capital gain reinvested in a new property is deductible. Actually the “vast majority” of mortgages in Sweden are interest-only, he added. In 2012, the Swedish financial market regulators estimated that the average amortisation period was close to 148 years – in effect, borrowers rely on ever-increasing house prices to prevent them from falling into negative equity. “In our view, relying on continuing price appreciation to increase mortgage equity entails significant systemic dangers, especially in a low inflation environment, as the real estate investment process turns into price speculation,” Troiano wrote in the report. This entry was posted in News and tagged banking, banks, central banks, Federal Reserve, housing bubble, housing crisis, housing prices, interest rates, Sweden, UK housing crisis on January 30, 2015 by Antonia Oprita.